Historian Professor Bipan Chandra is not amused at the government's installation of Vinayak Damodar Savarkar's portrait in the Central Hall of Parliament. In an interview to Chief Correspoondent Tara Shankar Sahay in New Delhi, he spoke about the reasons why Savarkar cannot be regarded as a role model. What do you think about the government's installation of Vinayak Damodar Savarkar's portrait alongside Mahatma Gandhi's in the Central Hall of Parliament? My first major objection is installing his portrait in Parliament at all. Its very sight is vulgar. Why should Savarkar's portrait be put up? The act of putting up a statue or portrait in Parliament is not simply to honour a person. They are supposed to be role models for citizens. In every country, including ours, young people come in busloads to be shown around Parliament. The purpose is that they should emulate a, b, c, d as their role model. It is wrong to put Savarkar's portrait in Parliament. Young people should not be told to emulate him as their role model. When we were young, he, Savarkar, was a role model. We respected and honoured him from the point of view of commitment, sacrifice and courage during India's freedom struggle. But Savarkar broke down in jail (he was transported to the Andamans for life imprisonment under the British government) and a person who breaks down cannot be seen as a role model. Bhagat Singh, when he was very young, subscribed to individual terrorism but gradually he realised it was not the correct path -- which was organising a mass movement to force the British to leave India. Bhagat Singh was sentenced to be hanged. A friend asked him why he did not tell his younger comrades that he had given up individual terrorism and he replied if he had done so, it would have seen by the world as an indirect act of seeking clemency since he had been sentenced to be hanged. Therefore, he did not tell his younger comrades. Bhagat Singh's silence on this count was to fight it out so that his younger comrades would also fight it out. He knew if young people lose faith in the courage of a hero, they would break down. Bhagat Singh's reasoning was that revolutionaries' courage was more precious than the correct path because the correct path could always be found. But faith, once lost, can never be recovered. What Savarkar did was to take the opposite direction. He apologised, he begged for clemency from the British government. He told the British if they released him he would tell his comrades that the path he was following was wrong. 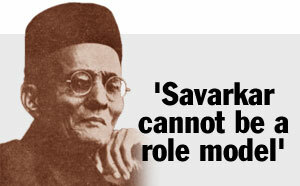 Therefore, Savarkar's breaking down means he can no longer be seen as a role model. Could you throw some more light on this episode? But Savarkar had one good quality. He was honest in whatever he did. In his autobiography My Years In Andamans, Savarkar explained it was true that he did not join the hunger strike. He was roundly reprimanded by Chakravarthy. So how can the BJP government make Savarkar a role model? Is there any other aspect? The other reason is there was an ongoing anti-imperialist struggle and Savarkar was a part of it. He wrote a book called 1857 - War of Independence. One of the things he emphasised was Hindu-Muslim unity in India because he was aware of the fact that one could not fight British imperialism with one-fourth of the population alienated. Even at that time he had certain anti-Muslim prejudice. Our national movement from the very first day from 1870 onwards favoured unity of all castes, classes and all areas because unless the Indian people were united, it was impossible to strive for independence against the mighty British empire. Now what did Savarkar do when he was released? Firstly, he accepted humiliating conditions including his non-participation in politics. That is not so bad because that doesn't make him a villain. But even after all this, he still wanted to be a prominent person. How can you be a prominent person (in those times) and not be an anti-imperialist? So Savarkar chose to become a communalist. This was the only political channel open to him. By the way, it was the reason why Jinnah turned to virulent communalism. Where did Savarkar proceed from that point? Savarkar was an atheist. When he was the Hindu Mahasabha president he used to give lectures on why there is no god. So the question was, how can you be a Hindu communalist and yet be an atheist? So he coined the concept of Hindutva. He described Hindus as those whose holy places are in India. Which means Muslims and Christians are out of the pale of Hindutva. Consequently, Savarkar gave a tradition of communalism. In 1937, he even adduced the theory of two nations. The interesting thing is, very few people knew about his Hindutva part. Once Gandhiji became aware of this, he said his politics and that of Savarkar were totally different. Neither his Hindutva aspect nor his apology aspect were known largely, people knew about his involvement in the assassination of Gandhiji for which the court said Savarkar was not guilty. People did not realise it was not important who Gandhiji's assassin was. It was Savarkar and Golwarkar who declared Gandhi as anti-Hindu. They carried out a campaign that Gandhi was anti-national and anti-Hindu and that he was a lover of Islam and wanted India Islamised, his non-violence meant disarming the Hindus. The hatred against Gandhiji was spread by the Rashtriya Swayamsevak Sangh and Savarkar who was an important leader of the Hindu Mahasabha. The important point is not whether Savarkar organised the conspiracy to assassinate Gandhiji. What is important is Savarkar was the theoretician of Hindutva, its ideology. How is it that this personality of Savarkar remained concealed for a long time? I came to know about his personality when I wrote my book on communalism in India. Scholars like me and political leaders were unaware of it. Savarkar's comrades in jail, those who have survived like Chakravarthy, wrote their accounts in Bengali and other languages and so the knowledge about Savarkar was limited. However, (historian) R C Majumdar wrote about Savarkar's apology aspect. Unfortunately, it is only during the last 3, 4 years that Savarkar's true identity came to be known. Vishwanath Mathur, one of the two prisoners in the Andamans who is still alive and who was there with Savarkar, brought out these facts in his book. It was after (Deputy Prime Minister) L K Advani changed the name of the Shaheed Park outside Andamans jail into Savarkar Park that Mathur protested. Why did Opposition leaders not protest against the installation of the portrait in Parliament? That is because our leaders don't have the time to go deeply into these vitals aspects. Their mistake is, when they have to take important decisions, why don't they consult experts in the field? After all, if (Marxist MP) Somnath Chatterjee has to decide on an economic policy, he will go to his party economist. He will not take a stand on his own. On this issue too, they (Opposition leaders) should have referred to experts. What impact will such a decision have on the nation's political spectrum? Unfortunately in our country, we are being guided by chauvinist type of ideas. Today, you cannot criticise any major Bengali leader, you can't say a word against, say, Subhas Chandra Bose. You can't criticise any Akali leader, you can't criticise any major Marathi leader in Maharashtra. So what panacea do you suggest for such regional chauvinism? You can educate through writing. Political parties should undertake this task but they are afraid of losing elections. This kind of narrow parochialism is highly undesirable. It is the job of the media and intellectuals to oppose it. Unfortunately, the press too caters to it. Why does the government continue on its Savarkar trip despite knowing the intricacies? That is because this is a communal government. The RSS created the Jana Sangh in opposition to the Hindu Mahasabha. People don't realise that the Jana Sangh was created not only in opposition to the Congress but also to the Hindu Mahasabha because you cannot have two communal bodies. They believed the Hindu Mahasabha failed to do the job. They did not play up the Savarkar angle all these years but they are doing it now because they have shifted their ideological position from Hindu rashtra to Hindutva. What exactly does Hindutva mean? Hindutva is nothing but Hindu communalism. But the word 'communalism' is so dirty in our country that even communalists don't call themselves communalists. The votaries of Hindutva have shifted from their initial stance on Hindu rashtra. But public memory is short, who remembers what happened in 1948 except people are above 70 years. Is this why Bharatiya Janata Party leaders are now throwing up Savarkar in bold relief? Obviously, the BJP is now using him as an icon. Moreover, it lacks intellectuals of any standing and Savarkar was an intellectual. How do you explain Savarkar supporting Nazism and Fascism? That is because of his anti-Muslim stand. He felt Hindus were in majority and, therefore, they should rule the Muslims like what Hitler was doing to the Jews. This is a totally wrong.Iam not with this what savarakar diid for our country first read it .stop publishing this kind of things.